For the first time in years, I bought - and wore - a pair of SHORTS. The thought was tempting, yet paralyzing at the same time. I hadn’t worn shorts in public in, oh, about two or three years now. I generally avoid baring my legs for fear of inviting unwanted stares or comments, innocent or otherwise. It’s just too embarrassing, too vulnerable. My swollen leg has been a source of insecurity and shame for as long as I can remember, and to hide it has been the easiest way to avoid those feelings. But no more! I went to Target with a couple of my girlfriends and grabbed a bunch of shorts off the racks, determined to at least try them on. If I didn’t end up buying them, there was some solace in the fact that I had put them on, even for a few minutes. I sifted through my loot in the dressing room: two pairs of denim shorts, and a pair of gray athletic ones. Took a deep breath. Slid on the first pair. The denim shorts were a no-go, just based on the fact that there were hardly any shorts to speak of. They were tiny! Swollen leg or not, there was no way I was going out in public with half my buttocks exposed. Nope – next! The athletic shorts were a better option, by far. Comfortable and simple, they seemed the most suited to my needs that weekend of hiking and climbing rocks. But – oh! – my leg. There it was, totally exposed, totally swollen. I had second thoughts about buying the shorts, silently cursing my leg and lymphedema in general. Perhaps I’ll suffer through the heat in a pair of yoga pants after all, I thought to myself as I turned in the mirror, eyeing my leg from different angles. But then I realized that there is no reason to be ashamed of my body, that there is nothing embarrassing or ugly about my leg. Sure, it’s a little swollen. So what? It doesn’t define me, and it sure as hell shouldn’t dictate whether or not I wear shorts or dresses when I want to. Just because I don’t have shapely gams does not mean I am less of a person. Who I am is much deeper than my physical appearance, and my worth and value are not contingent on whether or not my foot will fit into the latest footwear trends. I think this is something that every lymphie must acknowledge about themselves, because it is so easy to slip into self-doubt and shame over our condition. Yes, it’s okay to have bad days where we wallow a little bit – but the key phrase there is “a little bit.” If we get sucked into the cycle of feeling bad about ourselves, we’ll never get out. It’s best to embrace ourselves every day, with love and gentleness and care. And we can’t be afraid to be ourselves, either – swollen bits and all! So, I bought the shorts, and I wore them not only on the hikes but during our forays into downtown Sedona, too. It was liberating and I felt empowered to finally take the plunge and wear them again. I noticed a couple people looking at my leg, but I ignored it. I’m not going to apologize for or explain my leg; it is what it is, and it’s not going anywhere anytime soon! Best to embrace it, and keep moving forward. What are your latest lymphedema milestones? Or do you have any that you are hoping to accomplish? Climbing around Cathedral Rock in Sedona. Your story is so amazing!! That is such an incredible milestone. My milestone is finally being able to fit into ankle high boots and now having the option of wearing heels at work. I still need to work up the courage to wear shorts but your story has inspired me and gives me hope of a somewhat ‘normal’ life in the summer! Congratulations again and btw I would never have known which leg had the lymphoedema if you hadn’t pointed it out! That’s a huge milestone! Congrats to you, Dee, and here’s to many more milestones to come! Thank you for the reblog, Helen! Hello, Sherry. I wasn’t wearing a stocking because the one I currently have is old and doesn’t have much compression anymore – I need a new one desperately. I probably should be wearing one, though, because it would have helped move the fluid a lot better during the hike! ALso, how di the heat affect the swelling? 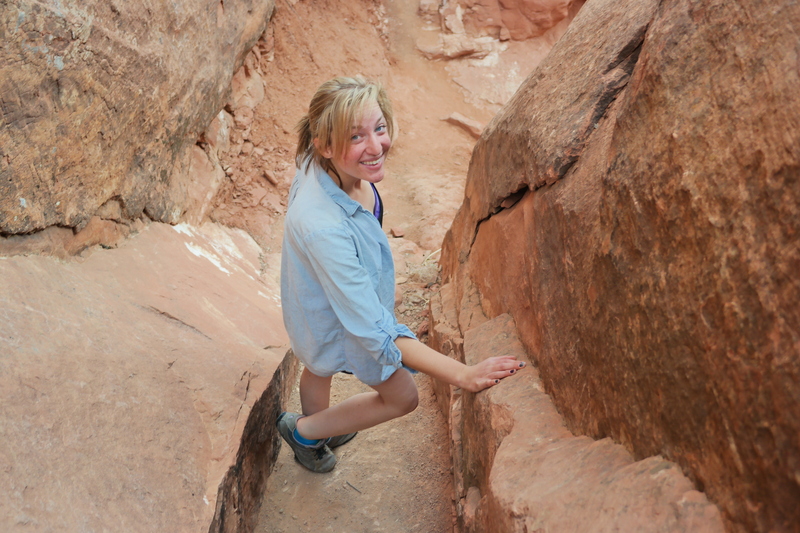 Weren’t you afraid of getting cellulitis from a cut or scratch hiking? The heat wasn’t too bad, actually. I think because I kept moving that it helped keep the fluid from “settling”; if I were sitting in the heat and not moving around, then the swelling probably would have been worse. And I was mindful of scratches and cuts while hiking, avoiding the cacti and thorny bushes during the hike. That’s a good point, though – I was being a little reckless by not wearing a garment. When I first contracted lymphedema after surgery in which lymph nodes were removed and radiation followed (now 8 years) I was told to wear bandages at night ( I now wear a compression garment) to reduce the swelling and a compresion stocking during the day to keep the leg from swelling. Consequently you can not see much difference in the two legs. Please get new stockings with 30-40 compression Alexa. I wear boots and high heels (with slacks)but always the stocking. Also. because lymph is mostly protein and so close to the surface, any scratch or cut can get infected quickly and develop celulitis. This can be deadly. I was hospitalized for four days with intraveneous antibiotics due to celulitis so that’s why I caution about bare legs! Outstanding, Alexa. Absolutely a “watershed” moment when we decide we are not defined by our lymphedema; we are who we are in so many complex and delightful ways. So wear those shorts. I love it that you’ve made this plunge. Now, my young friend, about those garments? Are you doing okay without the daytime compression? And if you do wear garments outside, be careful on hikes that you don’t rub against some rocks. I’ve “dinged” a few garments over the years but that’s a small price to pay for the freedom of being you. And you do rock (yeah, I know there’s a rocky reference or “pun” in there somewhere). Wearing shorts is so liberating! My next step is getting fitted for a new garment and wearing shorts and (gasp!) maybe some short dresses with the garment exposed. It’s a huge fear of mine but I am looking forward to overcoming it once I get fitted for a new garment. Props to you for wearing shorts! That’s awesome! Awesome i have to wear 30-40mmhg waist highs also. Thank you for sharing your experience. I go through the same thing whenever there is a river trip in canyon country. You look radiant in those red rocks. Thanks for the help. Fabulous! You look great! The other night going out to dinner I took my armsleeve off in public for the first time in over a year. It was very freeing. Little moments!! Sometimes it’s those little moments that help us get through the bigger ones! Thank you Manuela! Hope you’re doing well! What a fantastic post! Alexa, you show courage in so many ways: Courage to live your life the way you choose without fear, courage to be you, courage to share your thoughts with everyone. You speak the words we’ve often felt but stuffed down trying to put on a brave face. I am acutely aware of the size difference in my legs, though people might say they don’t see a difference to look at me. I used to cringe at the thought of getting into a bathing suit, but once in the water, feel an indescribable freedom. First off, you have lovely legs! Thank you for sharing some of that wonderful Sedona sunshine, and the beauty of Arizona coupled with your courageous and very encouraging words. What a beautiful, touching response, Jen, thank you! It really is an awesome feeling once you say “eff it” and go forward with your life without worrying about what other people may think about your lymphedema. Some days it’s easier than others, but whenever I do it, I feel great. I feel like me. Proud just doesn’t cover it…INSPIRED is more like it!!!! My happiness for you came out in the form of tears when Daddy read your post to me. There is nothing you can’t accomplish in this life, Alexa. Thanks, Mom!! I love you and Dad so much – thank you for all your encouragement over the years to help me be me. I get my strength from your love. Thanks for your story. It’s nice to know I’m not the only one who tried hiding my legs from the world. I have it in both legs and I live in Texas. I never wore shorts due to being embarrassed. I had a terrible accident last July where my leg was ripped open and due to the wound I was forced to wear shorts. I still am healing and I am still wearing shorts. It’s so nice to have them on but I still get embarrassed and self conscious. There have been times I was like this is me and I don’t care what others say but I found myself yesterday uncomfortable about my shorts weAring after I left my dr apt and then errand running. My husband and I were going to have lunch somewhere but I didn’t want to go because I had shorts on. Thank you for reminding me I’m not alone in lymphedema. Wow, thank you for sharing your story! It’s great to hear that you’re wearing shorts and fighting through the embarrassment. I totally understand where you’re coming from – some days are easier than others – but every day you overcome that and wear the shorts, you’re giving yourself the freedom to be yourself. You’re never alone in this! Be well. Your legs look beautiful. What a wonderful milestone wearing shorts! Your legs look great and wonderful that you are hiking! It is inspiring… My leg does not look so bad eather but even when i get in the shower it gets swollen very fast. During summee the garment is so hot but i dont dare to take them of cus it would blow up immediately…You dont have problems with tgis? Thanks for your post! Mine gets swollen in the shower, too – I love hot showers, but my leg definitely does not! Thank you for the comment, although I’m not sure what you mean by “tgis.” Sorry! Hi Alexa, have you ever tried any of the sport compression socks? http://www.compressionguru.com/sport/womens/running-fitness-socks Tons out there now, some are ok for lymphedema some aren’t great. They’ve become popular so no one knows if you’re wearing them for lymphedema or just because you like them. Get in touch with me with your measurements and I’ll send you a pair. Your legs look tiny!! :) I have lymphadema in my left leg. I haven’t had the courage to wear shorts let alone mini skirts for years and I’m only 19! It’s really annoying as i have quite a bit of swelling on my knee and upper thigh. Do you exercise lots?